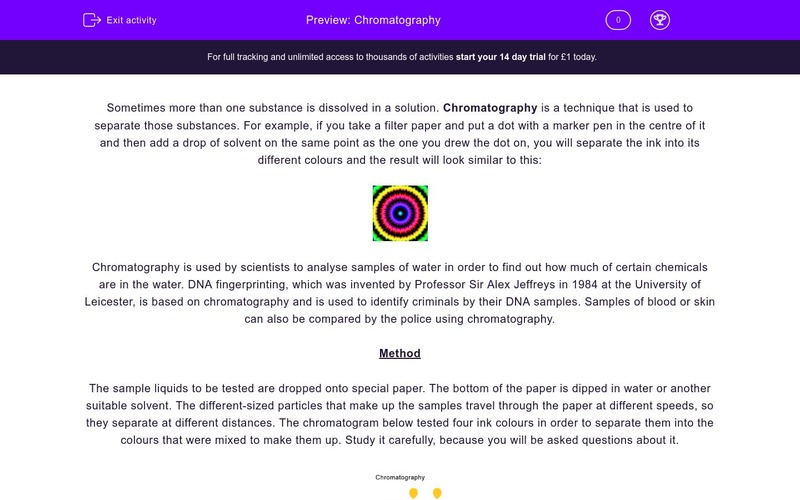 In this worksheet, students will learn about chromatography as a separation technique and its uses in the identification of substances and forensics. Chromatography is used by scientists to analyse samples of water in order to find out how much of certain chemicals are in the water. DNA fingerprinting, which was invented by Professor Sir Alex Jeffreys in 1984 at the University of Leicester, is based on chromatography and is used to identify criminals by their DNA samples. Samples of blood or skin can also be compared by the police using chromatography. The sample liquids to be tested are dropped onto special paper. The bottom of the paper is dipped in water or another suitable solvent. The different-sized particles that make up the samples travel through the paper at different speeds, so they separate at different distances. The chromatogram below tested four ink colours in order to separate them into the colours that were mixed to make them up. Study it carefully, because you will be asked questions about it. Name the technique used to separate different substances dissolved in a solution. DNA fingerprinting is based on a technique called distillation. The solvent used in chromatography is water. What do you call the paper that shows the results of chromatography? How does chromatography help in analysing water samples? There are two correct answers. Water is separated into its different components. Water may contain chemicals in it and they can be identified with chromatography. It is determined if a sample of water is safe to drink. Different ink colours will show up on the chromatogram. Water will be separated between still and sparkling. What kind of human tissue evidence from a crime scene may be analysed using chromatography? Tick two options. What two colours make up the purple ink? How do you know that brown ink contains blue ink? Purple is separated into red and blue. There is a blue dot directly above the point labelled as brown. There is a blue dot directly above the point labelled as green. 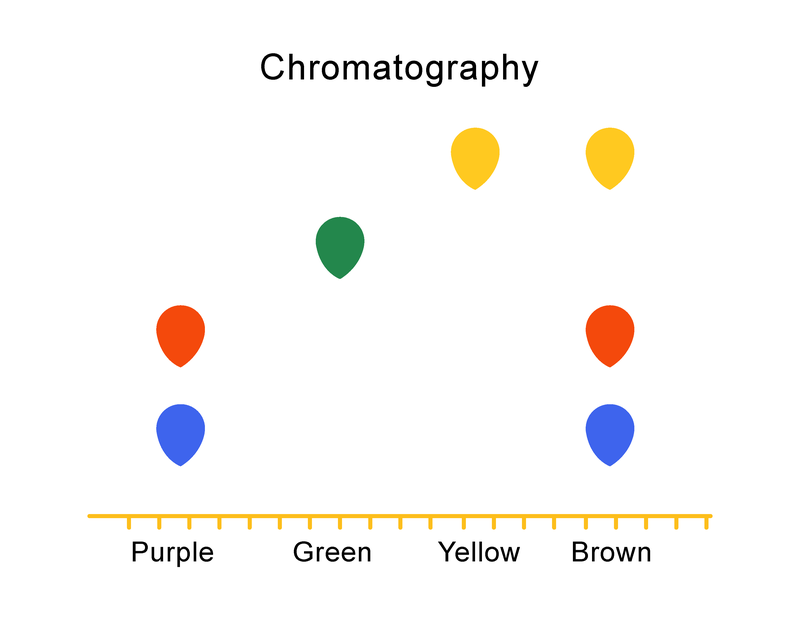 What colours make up the yellow ink in the chromatogram? Why do different substances separate at different distances in a chromatogram? Tick two options for a complete answer. The samples contain different versions of the same substance. The particles of different chemicals are of different sizes. Because the water dissolves them. The different-sized particles travel through the chromatography paper at different speeds. The results are shown on a computer screen and have different resolution. Sometimes there are different substances dissolved in a solution. Chromatography is used to separate them. DNA fingerprinting separates pieces of DNA that are of different sizes. Criminals can be identified if these are compared to known DNA samples. 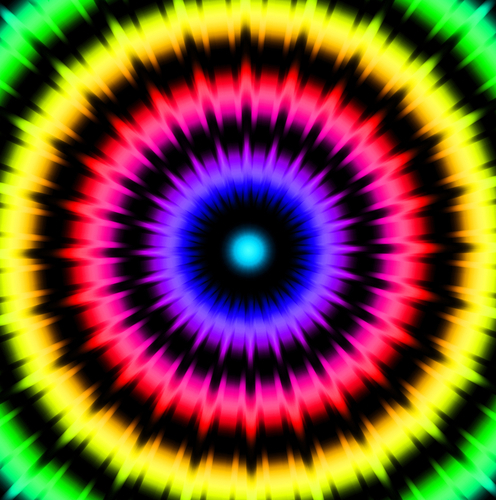 This technique is based on chromatography. Water is often used in chromatography. However, not all substances are soluble in water, so sometimes other solvents are used, for example ethanol. The piece of paper where the samples are loaded and on which the different substances are separated is called a chromatogram. Chromatography is used to analyse samples of water in order to find out if there are chemicals in it. Then it is determined if the water is safe to drink. Many pieces of evidence from a crime scene can be analysed to match with suspects. From the list above only blood and skin are from human tissue. This is what the question specifies, so blood and skin are the correct answers. The purple ink dot is separated into two colours directly above the point where the purple dot was drawn; red and blue. There is a blue dot directly above the point labelled as brown. This means that this particular brown ink is made of different colours including blue. The yellow ink is made of yellow only, as there is only a yellow dot directly above the point labelled as 'yellow'. Different substances have particles of different sizes. Those travel through the chromatography paper at different speeds.